You can book Everest Base Camp Helicopter Tour on any day. Activities on Everest Base Camp Helicopter Tour: Fly over fascinating village including Namche Bazaar, Tengboche, Dingboche, Gorak Shep, Everest Base Camp, and Khumbu glacier, landing at Kala Patthar. Having breakfast at Everest View Hotel. Everest Base Camp Helicopter flight landing tour is a rare treat; the opportunity to unfold the great Himalayas of the Khumbu region. Basically, there are three ways you can reach the Everest Base Camp: Jiri to Everest Base Camp, flight from Kathmandu to Lukla and trek to Phakding, and finally a helicopter flight tour to Everest Base Camp. 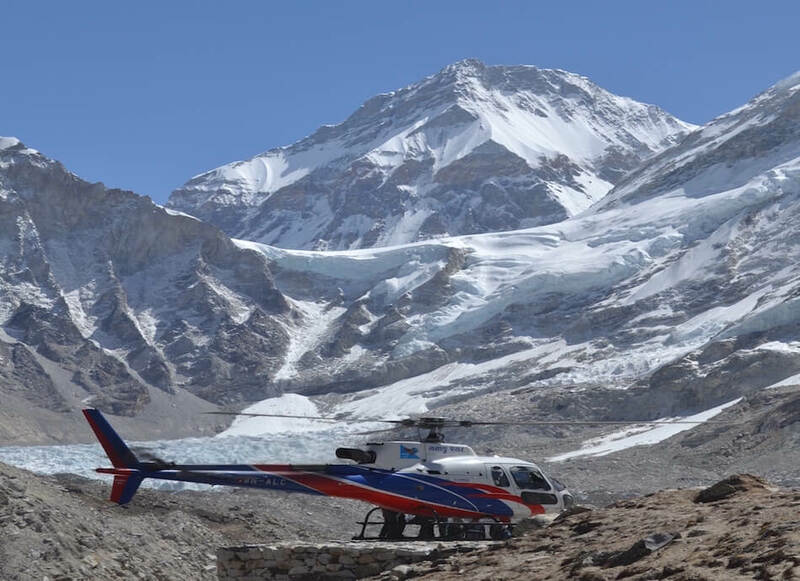 Among three options the Everest Base Camp Helicopter with landing is the fastest within one day, enjoyable, and risk-free way to get to the Base Camp. 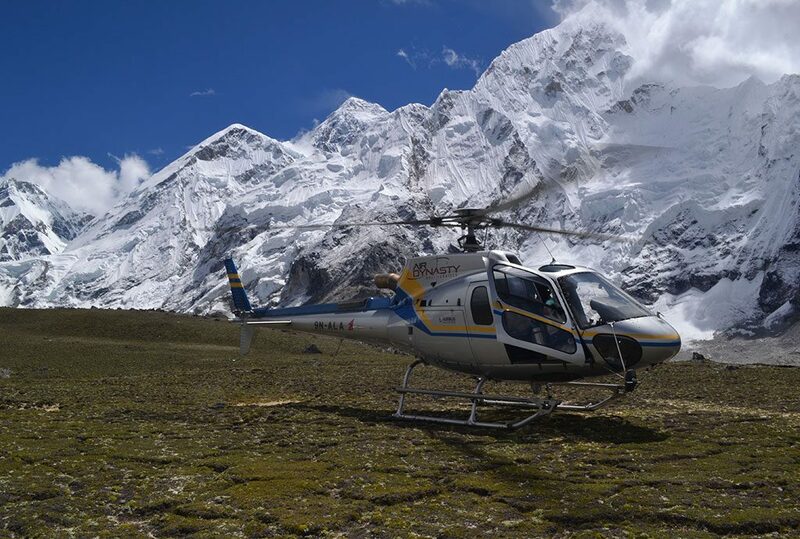 Everest Base Camp helicopter tour is one of the best aerial tours all over the world. Flying over the base of the world’s tallest mountain will save your lots of time of travel. 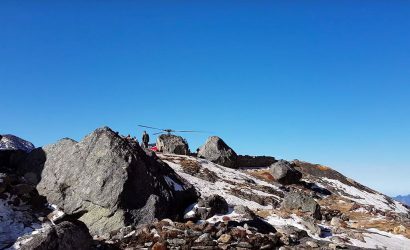 This huge saving of time and energy is one of the reasons that helicopter to Everest Base Camp is becoming our most popular Nepali helicopter tour package. During this helicopter tour, you’ll get ample sightseeing spots. Tengboche Monastery, Gorak Shep, Everest Base Camp, Kala Patthar, and Khumbu Glacier are some major spots. This helicopter tour is both thrilling and jaw-dropping. From the start to the end of your helicopter flight to Everest Base Camp you’ll not get a chance to give rest to your eyes even for a second. This Kathmandu to Everest Base Camp Helicopter flight can accommodate from min 2 pax to max 6 pax. We ensure you’ll get full window seats that allows you to enjoy marvellous views and scenery. Everest Base Camp Helicopter flight landing tour starts from the Kathmandu valley. First stop will be at Lukla airstrip for short fueling purpose. Here you’ll witness the first glimpse of Sherpa culture and lifestyle. After some refreshment, the flight head towards Everest Base Camp above many Sherpa traditional villages including Namche Bazaar. Then flying high above Khumbu valley here you’ll catch the views of Mt. Nuptse, Lhotse, Pumori, massive Khumbu Ice Falls and glaciers. Then your flight continues to the base of legendary Mt. Everest. Now you’ll get closer to Mount Everest, the highest point of the world at 8,848 meters (29,002 feet). Here you’ll get ample of time to capture beautiful pictures. Just trigger on your camera snap button! Kala Patthar is a paradise for the photographer. It is the best vantage point to get the close view of tallest peak Mt. Everest. During the expedition month, the Base Camp view looks amazing with colourful tents. After relishing the beautiful moments at Kala Patthar, you’ll fly towards Syangboche Airstrip, Everest View Hotel. Here you’ll enjoy five-star lunch and eventually depart for Kathmandu. Although it is an expensive helicopter tour package, every moment is worthful with stunning mountain views. Come, enjoy this scenic heli ride and fulfil your dream to catch a glimpse of world highest peaks! If you are already six person for joining this flight ( your own group ) with 500 KGS all together cost you 900 USD per person, however if you are less than the require number of person, cost may will increase and condition may apply. We do our best to provide best cost for our group to join this amazing flight. Early in the morning, we’ll pick up you from the hotel and drive to domestic terminal of International Airport. Your journey starts from Kathmandu Airport. As the Helicopter move eastward, you’ll be welcomed by the magnificent vistas of green hills passing Dolakha village around Jiri village. Heli ride continues over the Lamjura-La-Pass of 3,550 m high, covered in thick rhododendron forests. After 45 minutes, helicopter lands at Lukla with the magnificent view of chains of Himalayas. 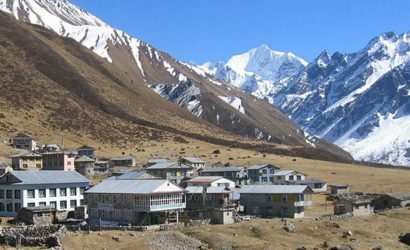 Lukla is situated at an elevation of 2,820 m above sea level. Lukla airport is one of the famous small airports with a small runway in the world. Here you’ll get some time to observe the local Sherpa traditional life. You’ll see many guides and porters are waiting for their clients. After a short stop for fueling purpose at Lukla, you’ll fly towards Namche Bazaar. Namche Bazaar is a Sherpa capital of Khumbu region. It is also famous as the gateway to the Everest region. From Namche Bazaar, we will head higher towards other interesting villages including Syangboche, Tengboche, and Gorak Shep. Also, during the Everest Base Camp Helicopter Tour, you may spot some trekkers making their way to Base Camp. From the window, you’ll enjoy the view of beautiful Khumbu Valley surrounded by some world’s highest peaks. Then, you’ll fly over Everest Base Camp will offer you a glimpse of Khumbu icefall and glaciers. Admiring all these views next you’ll stop at Kala Patthar for the majestic view of the world’s highest mountain and its neighboring peaks. The helicopter will stay for 10-15 minutes, then fly back to Syanboche to the Everest View Hotel. The hotel’s terrace offers an indescribable view of different snow-capped mountains and Everest peak. Here you’ll get to enjoy the five-star breakfast with the majestic mountain views in the distance. After enjoying this magical journey, you’ll fly back to Kathmandu and transfer to your hotel. Definitely, it is stunning once in a lifetime view! Direct Email us at everestassitance911@gmail.com for the best deal. Khumbu Village developers (Tax 18 USD) 2000 NRS if applicable. Airport Tax. ( 1.5 USD ) 200 NRS. Everest Base Camp weather and climate depends on the seasons and the altitude. Everest Base Camp experience four different seasons in the whole year: Spring, Monsoon, Autumn, and Winter. In Spring season, starting March till May, the weather is mild around the Base Camp area. The daytime temperature is warm at around 15°C. Whereas mornings and nights are still cold with -10 °C temperatures. Visibility is also quite good. By the end of the season, the temperatures start to increase and weather pattern changes. During this season, the view of a landscape, especially at the lower hills looks amazing with the blooming rhododendron. Monsoon starting from June till early September is not considered as the good time to go for Everest Base Camp Helicopter Tour as Mt. Everest is usually covered in mist/cloud. There is a high chance of flight cancellation due to poor weather conditions. Autumn, starting from September to November is the best time in Everest Base Camp. Weather conditions are favorable. It’s neither too cold nor too hot. The average temperature ranges from 20°C in the daytime to -10°C at night. The snow-capped mountain views are at their best. Winter, starting from December to February, has the coldest days in Everest Base Camp area. The temperature during the early morning and night falls below freezing level. The average temperatures range from 20°C in the daytime to -17°C at night. With the freezing temperature, the chill wind and the heavy snowfalls are some challenges you might have to deal with. Despite cold temperature, the views are outstanding. Although Autumn and Spring season are regarded as the best time, bad weather still can occur. The weather around Everest Base Camp area especially at the higher altitude the temperature is unpredictable. So, flight cancellation and delays might occur. Just be prepared mentally. You need to wear appropriate dress depending on the season of the tour. Even during the warm season, you need to wear a warm jacket as Everest Base Camp lies at the high altitude. Most of the time, the temperature is below freezing level. Also, in the high altitude, UV rays have high intensity so it’s good to put on a high SPF sunscreen. Q1. Is Everest Base Camp Helicopter Tour with Landing at Kala Patthar safer? Safety is our primary concern. 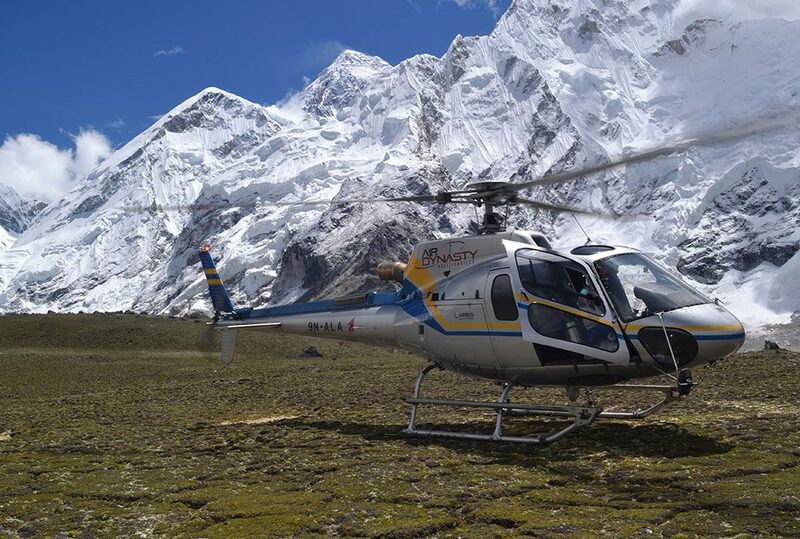 We always use powerful helicopters for Everest Base Camp Heli tour. Also, our pilots are highly experienced for flying around the high altitude. Another important thing you need to consider is altitude sickness. During this helicopter tour, the highest landing place is Kala Patthar which is 5,545 m above sea level. So, you can’t stay for a long as within the short period you’ll not be able to acclimatize well. Thus, for your health concern, we’ll stop just for 10-15 minutes at Kala Patthar. Q2. Who can join the Everest Base Camp Helicopter Tour? Everest Base Camp Helicopter Tour is suitable for any type of people from child to elder people. Basically, this heli tour is designed for time-bound and physically challenged travelers. There is no any age limit for this wonderful adventure. Yes, Nepali Heli-pilots are experienced for flying a helicopter around the high mountain terrain. They have been flying for a long time in the same arena. At the same time, they have great knowledge of the locations. They will able to deliver entire information related to mountain peaks. Besides, they’re also concerned about your safety. During the flight, you may ask questions about the Everest region or Mountain peaks. Also, for a private tour, we provide you with an experienced guide. Q4. 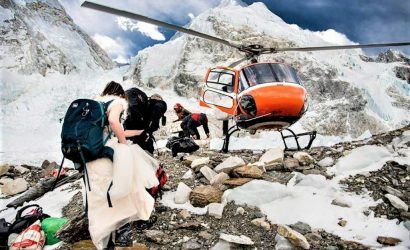 For how long helicopter can stay at Kala Patthar? Don’t worry about it. You’ll get enough time to go out from a helicopter and enjoy the surrounding view. Basically, the flight tour will be for 3 to 4 hours. Weather is generally clear in the morning, so you can get a mesmerizing view of surrounding passive peaks including Mt. Everest and capture the picture in your camera. Actually, while landing at Kala Patthar our pilot will not stop the Helicopter engine due to some technical issue. So, you’ll get approximately 10-15 minutes time at Kala Patthar. 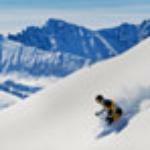 Despite this, you can’t stay for a long time as altitude sickness might hit you. No matter, how much you acclimate, altitude sickness can hit the healthiest person. Nothing can heal better than descending to a lower altitude. Q5. 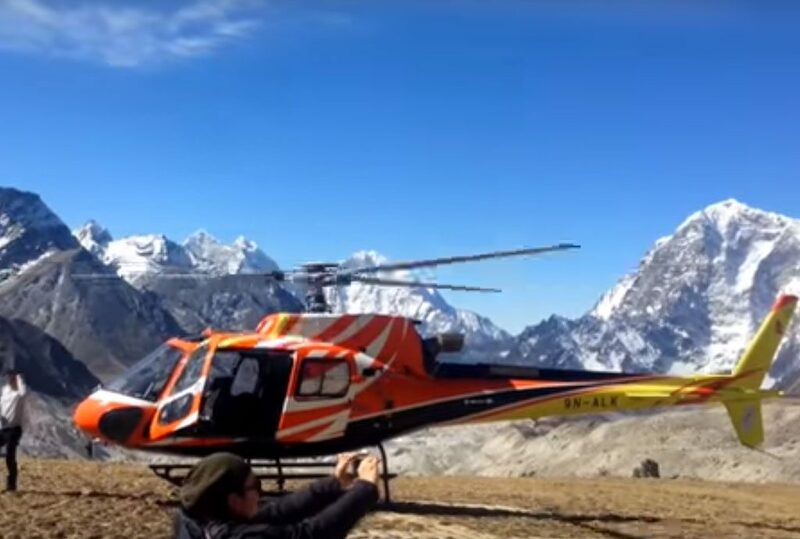 How can I book Everest Base Camp Helicopter Flight Landing Tour with your company? Booking Everest Base Camp Helicopter Flight Landing Tour with us is an easy process. You can book from anywhere in the world. Bookings can be made online or by contacting us by phone, email or via our social channels. We need just your exact date for the trip with a copy of passport. Q6. Does helicopter land at Everest Base Camp during this one-day heli tour? 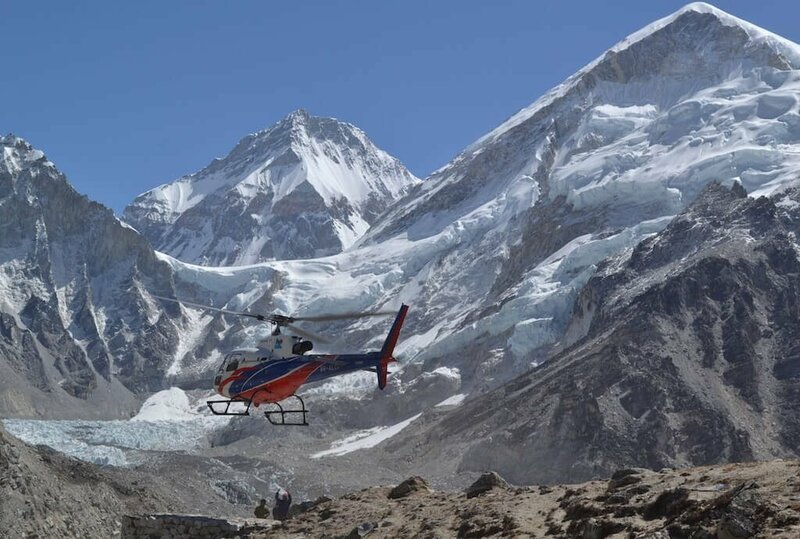 Yes, the helicopter will land at Everest Base Camp, but depending upon the weather conditions. Sometimes, due to the high wind speed, it gets very hard to land at Base Camp. Due to landslides, sometimes helicopter landing spot also disappears. But one thing, Kala Patthar viewpoint is the best viewpoint to get the close and personal view of Mt. Everest. From here, the surrounding peaks also look amazing. Q7. Do you carry oxygen tanks in case of emergency? Good question! Yes, we always carry oxygen cylinder for an emergency. Your safety is always our first priority. Q8. Is there any helicopter ride to Everest summit? Our Everest Base Camp Helicopter ride with landing at Kala Patthar, fly over the Khumbu glacier, the biggest glacier in the Everest region. But there is no any helicopter ride to the summit of Everest. The wind condition and pressure at the top make it impossible. However, for the rescue purpose, we can fly over most part of Mt. Everest. Q9. 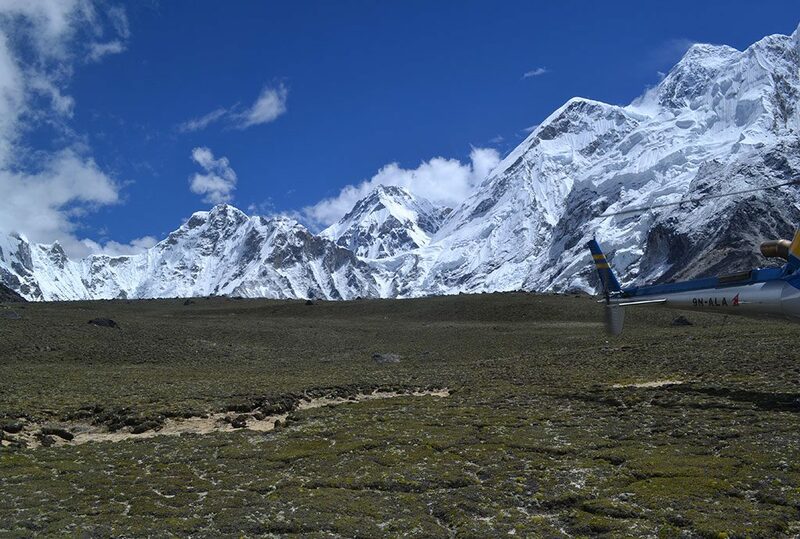 Does weather affect the Everest Base Camp helicopter flight landing tour? Yes. We have to follow the Visual Flying Rules (VFR) conditions for any helicopter flight to take place. Also, weather in Everest region, especially at higher altitude is hard to predict. But still, we stay in touch with local people for a live update. During the monsoon season, usually, the weather is not clear due to fog and cloud. Thus, the flight may get affected. But the early morning flights are still possible offering the great view of snow-capped mountains. Q10. I am a Solo Traveler. 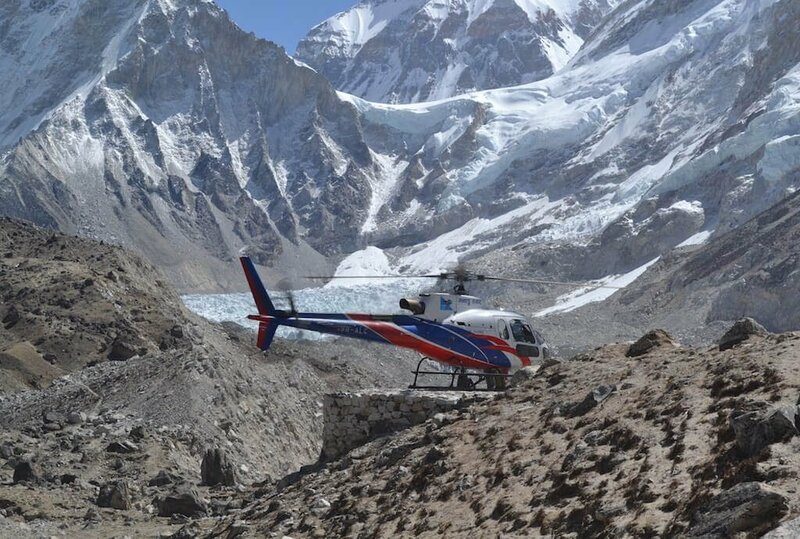 Can I take Everest Base Camp Helicopter landing tour? Yes, why not. We operate Kathmandu to Everest Base Camp Helicopter ride on daily basis. Just email everestassitance911@gmail.com or give us a call +977-1-4363372, +977-1-4355727, we’ll take care the rest. Q11. 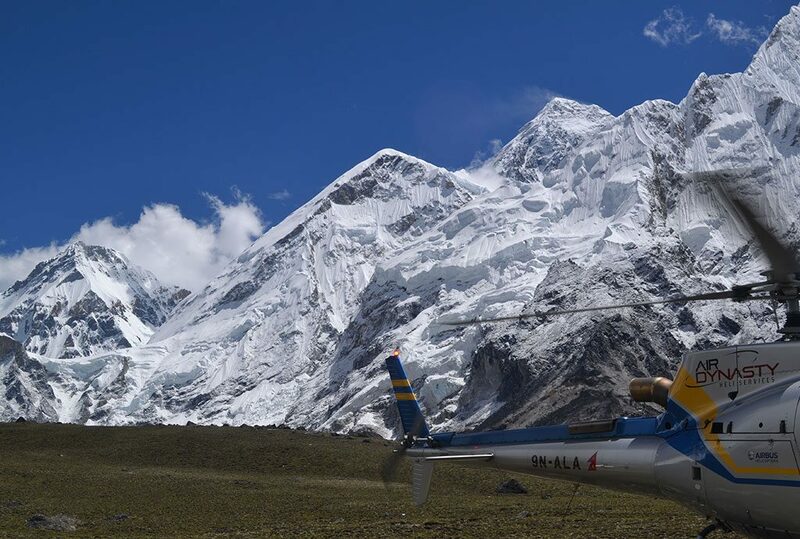 What are the peak seasons for Everest Base Camp Helicopter Tour? Basically, this heli tour can be done whole year around. However, the peak seasons for this heli tour are Spring (March-May) and Autumn (October-Mid December). During this season weather is favorable with the mountain views at their best. Q12. What happens if Everest Base Camp helicopter tour is canceled due to bad weather conditions? If this trip is canceled due to bad weather conditions, then we’ll fix it on next day morning. But if you don’t have sufficient time or you’re going for next destinations you’ll get a refund depending on booking term and conditions. Q13. What is a maximum number of people flying in one helicopter? Maximum five to six people can fly at once in one helicopter. We need to balance the weight inside the helicopter. So, it depends on your weight as well. But there won’t be people more than 6 in number. Q14. What is the maximum altitude during an Everest Base Camp helicopter tour? Starting from Kathmandu located at an elevation of 1,300 meters, the flights arrive at Lukla at the elevation of 2,830 m. The maximum altitude you’ll land at Kala Patthar on an elevation of 5,545 m.
Q15. 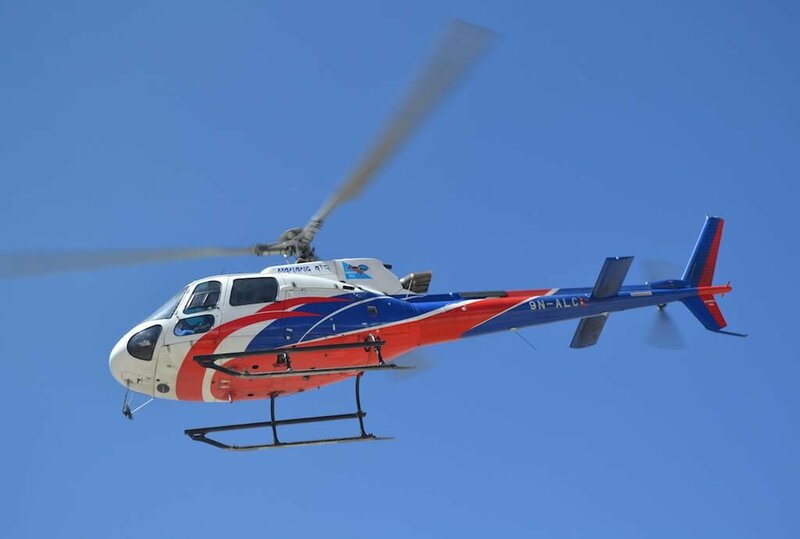 Can kids take this EBC helicopter ride? Yes, of course. This trekking package is suitable for kids and old people. They can easily take this flight without any problem. If you can’t make your trip, we’ll refund you. But please be aware, this is on the basis of our Booking terms and conditions time frames. We understand that certain things are not in our control (like flight cancellation due to bad weather conditions). So, we’ll make our best effort to change your booking. We have different types of helicopters presently operating in private sector; AS350b3e / series of helicopter manufactured by Eurocopter, France are famous all over the world and Beli Helicopter from the USA. We’ll beat every price offered to you by any other agency. Everest Assistance guarantees you the best price and you will still enjoy the excellent service we offer. That is Everest Assistances’ guarantee! During the booking process, there is no hidden charges. We’ll not charge you booking fees and no credit card fees. We are a Government registered company and are liable for everything we do. We have invested a lot of money, time, and effort into Everest Assistance. We live on repeat business and would love you to book again and again with us in the future. Therefore, we’ll do our best to make you happy! Our team members are there 24/7 to help you plan and book your trip. Don’t hesitate to chat with us or give us a call. We do our best to respond to emails and voicemail as soon as possible. The great thing about Everest Assistance is we offer flexible payment options. You don’t have to carry a large sum of money from your home to pay for your trips. You can make your payments using government authorized Visa / MasterCard, cash or travelers’ Cheque. We offer personalized packages. Simply let us know what you’re interested and we’ll provide you with the best suitable itinerary as per your requirement. 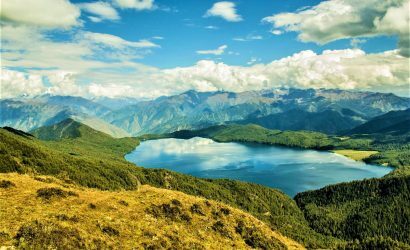 Each and every trekking packages itinerary are designed by our expert trek guides. We have dedicated and friendly team members. They have extensive knowledge of the region and are passionate about what they do. Everyday as per the booking dates and also the flexible dates submitted by you, it is Guaranteed. Please be prepared to have flexible 2-3 days for your helicopter trip as the weather plays a part to get a good view. They will advice you on a good day to fly in advance. Very quick to respond to you inquiry through watsapp and email. We had to postponed our flight to the 3rd day but it was worth it. Perfect and clear sky to view the mouintains. Overall good experience with them. When considering booking this tour I felt it was expensive and most likely a flight to base camp for 5 minutes then a short rushed breakfast and back. Not so! The adventure was relaxed and frankly the best tour i have ever done. Just the flight to the Himalayas was worth it. We landed first at an airport to switch to a copter that can fly higher than we were. We hung out looking at beautiful mountains and watching planes and helo’s come and go. I also feel that we were adjusting to altitude. Then we jumped aboard flying to Everest and surrounds. Outstanding. After our 5 min base camp landing we took off again seeing sites that are extraordinary. We then again landed and spent an hour or so eating, walking and enjoying the sites. Trip back to Kathmandu was also enjoyable and the sight seeing can’t be beat. This is the only way to go with the exception of Sir Hillary in the day. Your money is 100% Secure. 99.9 % of complete mission. Personal care from beginning to end of mission. 100 % Refund policy in case of mission incomplete. Land at the hospital directly in case of top emergency. Local agent of many reputed travel agencies. Working partner of Nepal’s reputed Helicopters Company. Providing uppermost standards of helicopter, teams and gears for all missions.